Researchers from the University of Texas at Austin gained insights into India's auto rickshaw industry from the perspective of rickshaw drivers and manufacturers. Photo by Premshree Pillai. In March 2010, my team of five U.S. MBA students had the opportunity to connect with a sector of society that was previously unknown to us – the auto rickshaw drivers of India. As part of our Global Connections course through the University of Texas at Austin, the team carried out a micro-consulting project with the Centre for Sustainable Transport in India (CST-India), a member of the EMBARQ Network (the producer of this blog) to analyze the auto rickshaw industry. Our intent was to capture the challenges and disconnect between two very different industry players: auto rickshaw drivers and auto rickshaw (or three-wheeler) manufacturers. In addition to extensive research on the auto rickshaw sector, the study incorporated 26 driver interviews that were carried out in Bangalore, as well as interviews with the prominent three-wheeler manufacturers. While they are an integral part of transportation in almost every major Indian city, the auto rickshaw drivers are perceived as a nuisance to the system. The findings of our study corroborated this point: auto rickshaw drivers are a struggling population caught in a system where they are treated with utter disregard by the government and are often resented by their own customers. Most of the recent auto rickshaw reforms have been reactionary, as regulatory authorities and traffic police attempt to crack down on poor behavior (traffic violations, emissions) as opposed to implementing systemic reforms. Meanwhile, manufacturers generally do not perceive rickshaw drivers as their end client, but rather focus on the passenger when designing and positioning their vehicles. This has created a crucial disconnect in the auto rickshaw industry, where the very people who ultimately drive the success of the industry (the drivers) are left out of the process. Our research of the auto rickshaw drivers revealed several interesting facts: it is more than 50% likely that a driver has a family of up to 8 people to support, and in order to do so, a driver works an average of 10-12 hours per day. Recent statistics from Delhi suggest that nearly 80% of auto rickshaw drivers rent their vehicles, and pay out roughly half of their daily revenue in rental fees. Information gathered from our own interviews with the drivers was consistent with these facts. 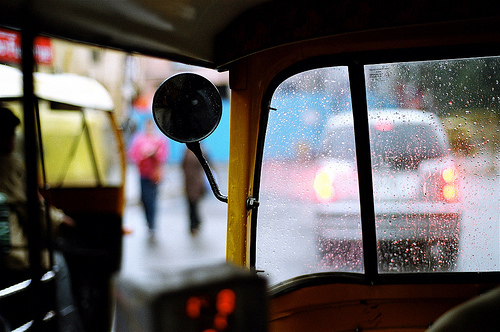 Our surveys revealed that auto rickshaw drivers have a considerably hard time at making ends meet. In their daily operations, the main challenges they face are: 1) too much traffic, 2) finding customers, 3) problems with the Traffic Police (who have to be bribed on a regular basis), and 4) lack of employment benefits, such as health insurance, due to the informal nature of the sector. While the interviews with randomly selected auto rickshaw drivers went relatively smoothly, the MBA group’s experience in India with the auto rickshaw drivers (what could be considered the “tourists’ perspective”) was the complete opposite. The majority of students who rode in auto rickshaws in Delhi and Bangalore were not given the option to use the fare meter but rather had to negotiate the fare from one destination to the next. Despite the agreed upon destination, drivers often took us to a different tourist location (commonly a souvenir shop) while still demanding to be paid. Many of our classmates speculated that there must be a kick-back for drivers who delivered tourists to these locations. Indeed, two auto rickshaw drivers who we interviewed revealed the details of the tourist payment scheme: If they succeed in bringing a group of tourists to a local shop, the driver will receive a two-liter gas coupon from either the owner of the shop or the “rickshaw boss.” A two-liter coupon is enough to keep a rickshaw tank full for at least a day and thus provides a strong incentive to break the agreed-upon route – and trust – with the tourist customer. On the manufacturing side, several recurring themes dominated the interviews with associates from Bajaj Auto (the largest manufacturer of auto rickshaws) and Mahindra & Mahindra (another prominent three-wheeler manufacturer). The three-wheeler manufacturing industry is highly competitive and the overarching trend among rickshaw manufacturers is an awareness of cost as an important factor for the drivers. All of the manufacturing companies possess the know-how to innovate and create more environmentally sustainable vehicles. However, because the end client is incredibly cost conscious, manufacturers cannot implement these expensive changes and still maintain sales volumes in the three-wheeler segment. It is only the government that can drive these changes by making environmental and/or safety regulations with which all of the manufactures must comply. Raise the Minimum Fare Rate: This might help auto rickshaw drivers make ends meet, and they would have less of an incentive to fabricate fares. However, this is a short-term solution, as auto rickshaw drivers are already spending too much time looking for customers. Create a Multi-Party Task Force for Market Research and Campaigning to Encourage Local Auto Rickshaw Ridership: A group of auto rickshaw unions, government agencies, NGOs and manufacturers could gather feedback from local citizens as to why they don’t currently use auto rickshaws, and use this feedback to improve the passenger experience. From there, a campaign could be launched to spread awareness about improvements to the system and outline the benefits of auto rickshaw transport versus other options. Ideally, the research, feedback gathering and policy development could be conducted by the nonprofits, while the for-profit organizations could provide necessary funding and have access to the data collected in order to improve their products. Improve Benefits to Auto Rickshaw Drivers: The government could consider offering benefits to registered drivers, such as health and vehicle insurance. This would help improve auto rickshaw driver’s day-to-day experience, reduce costs and also create incentives for vehicle registration and the use of valid permits. Establish an Auto Rickshaw Driver Academy: This initiative would start as a pilot program to educate auto rickshaw drivers in a certain area, not just on safety issues, but also on customer service. It would be voluntary to attend, but drivers who participated in this program could receive uniforms, a badge, or some other item to wear or attach to their auto. This signal could potentially help them attract new customers. Drivers who took the course could also receive other incentives, such as insurance, coupons for fuel, a free tune-up, etc. A similar initiative has been implemented in New Delhi by the Autorickshaw Star Club. Develop Direct Purchasing Opportunities with Manufacturers: Approach and encourage manufacturers to sell directly to rickshaw drivers. Manufacturers could provide financing through a micro-payment system administered through existing financing arms. (In fact, Mahindra & Mahindra already has a similar scheme in place for some of its agriculture machinery.) This new relationship could force out the financier middleman and provide better financing terms for drivers.